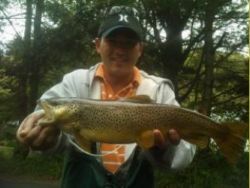 CTFishTalk.com: Will try for steelies this week - Connecticut Trout Fishing ( CT Trout Fishing ) - A Community Built for Connecticut Fisherman. LEAVING TONIGHT FOR UpSTATE NY will post if site lets me. lol when you look at your fish you caught you will see my trademark on it already!!! !